When my five-year-old began pestering me for violin lessons, I sensibly tried to divert her attention. I also had a toddler to chase around after, and another baby on the way. Life was hectic and I couldn’t afford to indulge my oldest child's every passing interest. I pointed out the obvious options. We already owned a lovely baby grand piano, inherited from her dad’s grandmother. We also had two organs, pump and electric, and a drawer full of my old flutes and recorders. What about those? She shook her head. Or ice-skating lessons, or how about Little League? She was temporarily distracted when I suggested T-Ball (turns out, she’d thought I said “skee-ball”). She agreed to give it a try. But after a disappointing session at the local ballpark, surrounded by little boys who’d been swinging bats in the backyard practically since birth and kept running up to her spouting off RBI statistics, Lauren put away her miniature glove and went back to begging for a violin. So I took the path of least resistance. I gave in. For our family, this was the turning point: the moment I dug out the Yellow Pages and started looking up music schools. I discovered that there was a Suzuki academy a couple of miles in one direction, and in the other direction, a traditional music school, the very school I’d attended as a child, for many years of traumatic piano lessons, beginning at age nine. I confess I was relieved when the registrar at my old school told me that my daughter was too young. I reported back to Lauren that she could begin violin lessons, if she still wanted them (and I secretly hoped that she would lose interest) when she was seven. Of course, she balked. She knew her own mind, and her mind wanted to learn to play violin. Now. I picked up the phone to call the Suzuki academy—but then I hesitated and dialed my mom instead. My mom would know what to do: she’s an arts administrator who’s spent her career in the world classical music; plus, she’s my mom. She put me in touch with some experts—music professors and professional performers, none of whom had anything good to tell me about the Suzuki Method. “No great artist has ever come out of the Suzuki tradition,” warned one. “Suzuki violin lessons are all tea and cookies,” intoned another. “No substance there.” They offered me the names and numbers of esteemed violin pedagogues, which I pretended to write down. I’d heard everything I needed to know. My decision was emotional—“perplexingly trivial”, to quote McCarthy. I’d grown up on the fringes of the classical music industry, and knew too well the difficulties of the profession; I had no designs to fast-track my little girl into that kind of life. And the music professionals I'd just talked to had sounded snooty and elitist to my ear. I didn't want that kind of environment for my daughter. I still had some residual PTSD from my own early music education. Plus, I do like tea and cookies. I went in for a meeting with the director of the Suzuki school, and by the time the interview was over, I had signed Lauren up for lessons. Half an hour on Wednesdays after school, and a group lesson on the weekend. At that moment, my distracted, on-the-fly, barely-researched decision altered the trajectory of our family’s lives forever. Too late to do anything about it. I had chosen. And the Suzuki lessons, how did that go? The answer is too complex to sum up in a sentence. During the months and years that followed, she, and I, and her dad, and then, one by one, her younger sisters, and two younger cousins were drawn down a path that was simultaneously frustrating and irresistibly fascinating. As it turned out, in many ways, my oldest daughter was, by temperament, spectacularly ill-suited to learning through the Suzuki method. The struggle itself became an adventure in self-discovery. We persevered for years before eventually transitioning each of them to traditional teachers-- and, yes, even top teachers who would have met the approval of the "snooty-elite" experts I'd interviewed so long ago. By then we were totally caught up in the thick of it. None of these particulars is important (as difficult, rewarding, and consuming as it all seemed at the time.) In the end, the lesson you sign up for isn’t always the lesson you take away. 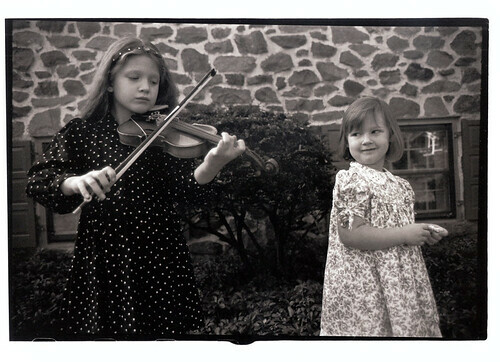 Lauren, now a young adult with a full-time job, and the founder/director of her own theater company, did learn to play the violin, as well as the viola. She studied for over ten years. She doesn’t play anymore; she’s moved on. But, as she often remarks, her early life in music profoundly and positively shaped the woman she grew up to be. As for her three sisters, all currently college students: one is an enthusiastic amateur; one has transitioned to guitar and mandolin; one is a senior majoring in violin performance at a New York conservatory. Throughout this year I’ll be writing topical columns for parents of young musicians—toddlers wrestling with Twinkle, twelve-year-olds learning Mozart concertos, teens transitioning to conservatory or even away from the study of music. These are the minor decisions, frustrations, and triumphs that preoccupy our daydreams, following the great decision, the turning point. I'm so glad you will be writing a blog for parents of young musicians! I had to laugh at that part with the tiny tots who had all been playing tee-ball since birth; what is up with that? I found that to be the case, too, and my kids certainly had NOT been playing ball since birth! What a gorgeous photo! It's true what your daughter says and I fully agree that a child's early life in music will profoundly and positively shape the person to be... It's so healthy and reassuring for pre-university students who have long taken their music studies seriously, to know that if they do decide to be a doctor, architect, social worker or scientist, they have not "wasted" their time/effort during those 8, 10 or 12 formative practising years. My teenager once phoned home to say she is exhausted from practising and still not happy with her playing. I replied: "It's ok to quit if you feel you don't have the fitness to carry on?" She has health issues. "Nothing is wasted; at the least, it has saved you from drink, drugs and any obsession with your weight/looks, right?" As a middle-aged mum, I have seen that music profoundly and positively made many music-mad teenagers mature with character well beyond their years regardless of whether the piano, violin, cello, flute or oboe continues as a serious hobby or a job-aim or simply a light-hearted Christmas affair.